The outbreak of war in Europe in 1914 found the U.S. Ordnance Department with only one operational rifle production center, Springfield Armory. Rock Island Arsenal was closed the previous year and wasn’t ordered to resume production until September, 1916. When the United States did enter the war early the next year, production at both Rock Island Arsenal and Springfield Armory was hobbled by a lack of skilled personnel who had gone to work at better wages for commercial arms manufacturers. 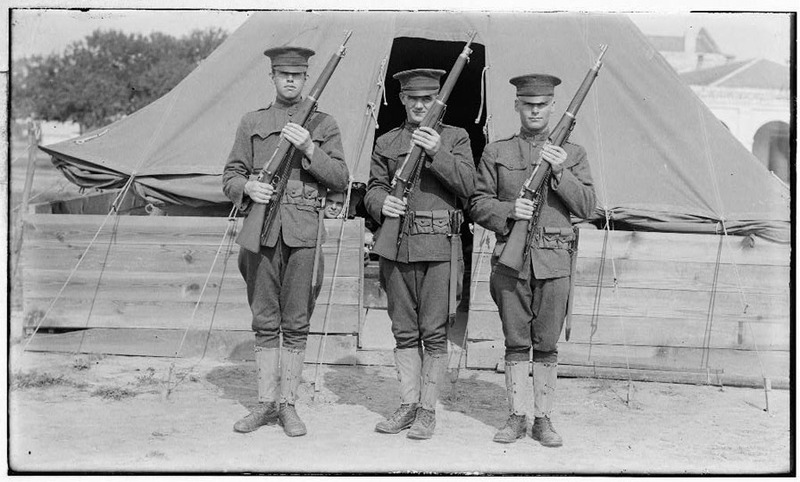 Although the U.S. was not yet at war before 1917, Remington, Winchester, and Eddystone were making the Pattern 14 rifle for Britain, and Remington was also making Mosin-Nagant rifles for Russia and Lebel rifles for France. As a result of this competition for skilled labor and following years of reduced appropriations under the Wilson administration, Springfield Armory found itself with a work force of only 608 men at a time when 3,000 skilled workers were immediately required. Most of the new men they could get were entered into apprenticeship programs. As a result, labor turn-over was high. Additionally, some rifle manufacturing facilities at Springfield Armory, altered for M1911 pistol production beginning in 1913, resulted in additional loss of rifle production capacity. 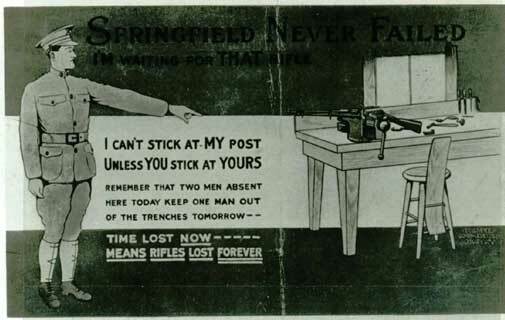 In April, 1917, Springfield Armory’s pistol manufacturing facilities were ordered to return to rifle production. Disappointingly, production of M1903 rifles in June 1917 was at a rate of only 175 a day. Much of the armory’s equipment and many of its machines were old and worn requiring expensive and rapid rebuilding to meet the demands of wartime production. By November, 1917, the influx of funds, personnel, and new machinery had swelled production at Springfield Armory to 1,000 Model 1903 rifles a day in a factory originally designed to produce 450 rifles a day. The labor force increased to 5,129 workers by June 1918 including 233 women employed in the shop (releasing an equal number of men for war service). Training and improved wages allowed the Springfield Armory to reduce labor turn-over. By the Armistice on 11 November 1918, 1,500 Model 1903 rifles were leaving Springfield Armory each day. That month, the number of employed men at Springfield Armory had reached 5,381 while the number of women had more than tripled to 748. However, without the demands of war, production rapidly fell to 300 rifles a day by February 1919 and in the months following. The workforce was subsequently reduced to peacetime levels but not before the workday was reduced to eight hours from ten upon notification of the Armistice at the armory.